Fourteen years ago I was perusing the aisles of a gift store when a greeting card caught my eye. 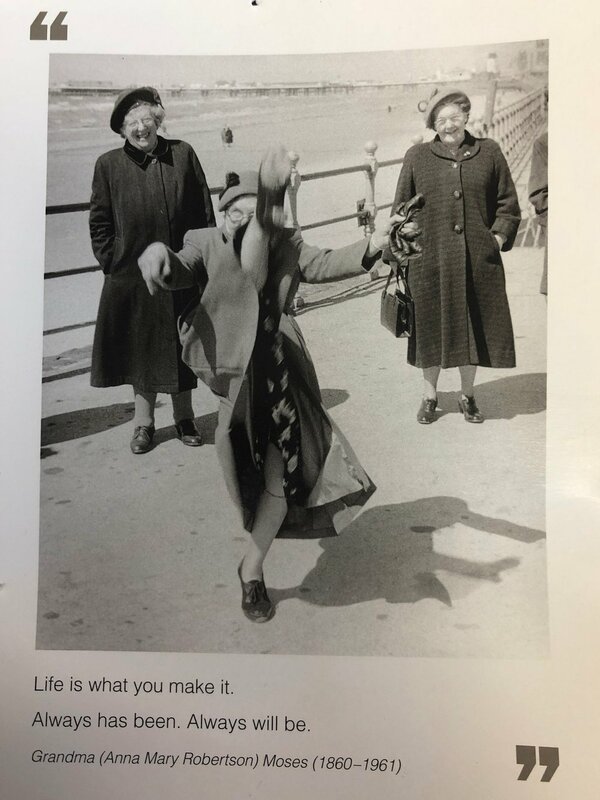 The card was a black and white photo of three grandmothers grinning from ear to ear because the grandmother in the middle of the photo was dressed to the nines, doing a high kick over her head. Underneath the photo was the quote “Life is what you make it. Always has been. Always will be.” Grandma (Anna Mary Robertson) Moses (1860-1961). I bought the card that day and it has been in my office ever since. I glance at the card every once in a while and it always reminds me that life is a series of choices. While we can’t control everything that happens to us in life we always get to choose how we respond. I would also argue that we control more than we realize. Do you know anyone in your life that is consistently in a good mood, no matter what they are going through? What about someone that always seems unhappy no matter how many gifts or opportunities they have been given? I am certain that we can all think of at least one person that falls into each of these categories. Why is it that some people can almost always be positive and some people can’t seem to find anything to be happy about no matter what their circumstances? Attitude. We get to choose our attitude each and every day. If we choose optimism and gratitude over and over again, good things will follow. That is not to say that you will never be thrown a curve ball or you will never have bad things happen to you; but if you make a choice every day to wake up and find the good in others and make it a great day, it usually is. The beauty in this, is that it is a choice. If you want something bad enough, you can have it. You are going to have to work hard, prioritize what it is you want over other things in your life, and continue to show up for whatever it is you are dreaming of, but the great days will outweigh the bad ones and your hard work will pay off. Along with our thoughts and attitudes we also get to choose who we spend our time with. If you want drama in your life, you can always find it. If you want to surround yourself with people that are not interested in causing or adding to drama, you can find that too. I have found that the latter is much healthier. Want to be successful? Are you spending your time with people that are going places or people that are content with being average? If you are not already doing so, start surrounding yourself with people who are building you up and pushing you to be better. Remember, life is what you make it. Always has been, always will be.